The alternative MMS interface, “Send MMS Notification” is intended for more advanced developers, and configurations where it is possible for NowSMS to be used as an MMSC for direct delivery (although technically this interface bypasses the NowSMS MMSC). 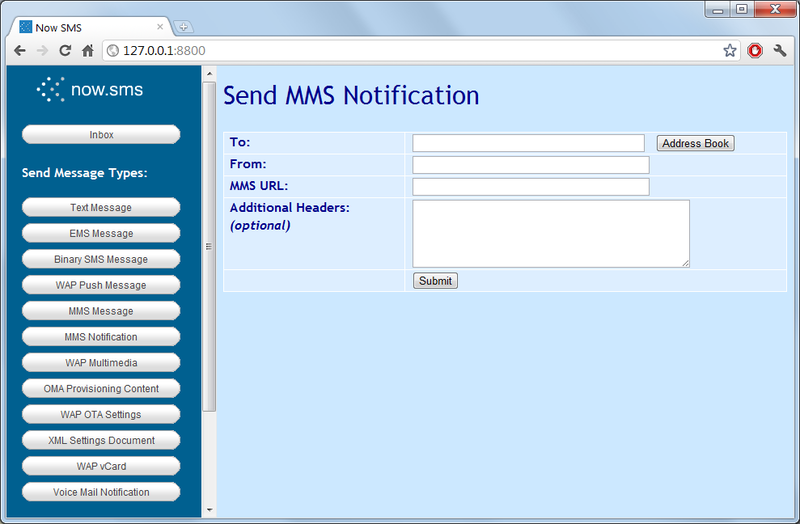 After creating a binary MMS message file, and storing the message file on a web server with a MIME type of “application/vnd.wap.mms-message”, this dialog shows how the gateway can be used to send a notification to the message recipient that instructs the recipient’s phone to connect to the specified URL to retrieve the MMS message content. Please note that many mobile operator MMSCs block MMS delivery from external MMSCs, and it may not be possible for you phone to retrieve an MMS message from your own web server URL without changing settings on your mobile phone. Note: When the “Send MMS Notification” function is used, the MMS Notification is sent to the recipient independent of the MMSC built-in to the gateway. The message recipient will fetch the message directly from the URL specified. As the message is not routed through the MMSC, the MMSC cannot provide dynamic content adaptation and conversion services. The “Additional Headers” option allows additional headers defined by the MMS Encapsulation Specification (MM1) to be inserted into the resulting MMS notification message. By default, NowSMS assumes that it is sending an M-Notification.ind PDU (MMS Notification) for the specified URL. However, the “MMS URL” field can be left blank, and a different PDU type can be specified via the “X-Mms-Message-Type:” header (for example, “m-delivery-ind”, “m-read-rec-ind” or “m-cancel-req”).